Microtonal pitch systems have musical implications beyond the organization of pitch, suggesting the possibility of functioning symbiotically with orchestration, rhythm, and form in a musical work. This essay focuses on three compositions, each of which approaches tuning and microtonality in a unique way: The Delusion of the Fury (1969) by Harry Partch, Limited Approximations (2010) by Georg Friedrich Haas, and Asking Ocean (2016) by Marc Sabat. After a general analysis of the pitch materials in these three works, passages of music are examined and compared to illustrate how pitch systems, especially those in extended just intonation, inform orchestration, rhythm, and form, exploring how these composers balance the practical considerations of writing microtonal music with artistic intent. 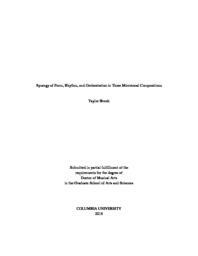 This essay argues that the success of these three works relates to a sensitivity toward the limitations and possibilities of their novel approaches to microtonal pitch organization.